Jerry Solomon, founder of Ashland Electric Bikes, began his love affair with all things two-wheeled as a child back in the sixties when he customized his first Stingray-style bicycle with a homemade (and not entirely successful!) chopper fork and sissy bar. 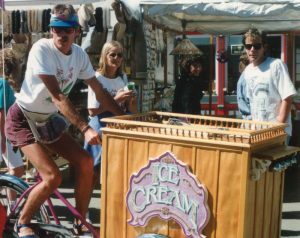 The adventure has continued, including a decade of extreme mountain biking in Crested Butte, CO, where he also did a stint as the local ice cream man on a custom three-wheeled-bicycle. Two decades in the graphic design and signage industries followed, always with bicycle commuting central to Jerry’s lifestyle. The journey now comes full circle with the launch of Ashland Electric Bikes. 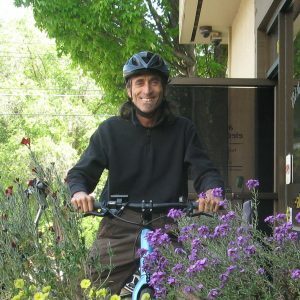 Jerry and his team are intensely committed to a cleaner, healthier world for ourselves and generations to come, and see electric bikes as a viable component of that vision. We are at a very definitive point in time on planet Earth. The collective decisions humanity makes in the next few years will have profound implications far into the future. Issues of sustainability and environmental impact are demanding our full attention. Transportation and the burning of fossil fuels must be revisited at every level. Ebikes play an integral role in re-envisioning the way we all literally ‘move in the world’. In these dynamic, changing times it is up to each and every one of us to do our part to co-create a healthy, sustainable future for ourselves and generations to come. At Ashland Electric Bikes we gain great pleasure knowing that we’re helping ‘green up’ the world…one bike at a time. So come “Ride the Future”. Its here now!